Cats sailed on the Mayflower that brought the first Pilgrims to America. 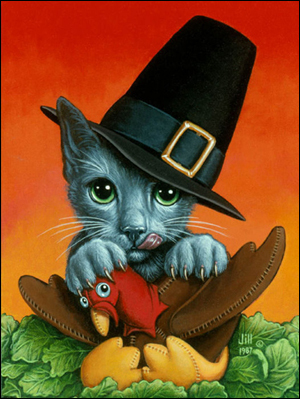 The felines were aboard ship to rid the food supplies of mice during the voyage, so your cats may feel more deserving to be celebrating Thanksgiving than most people. Unfortunately, a traditional Thanksgiving dinner can be loaded with ingredients that can make a cat very ill. Onions in the stuffing or garlic in the gravy can be toxic to a cat. The butter-basted turkey will upset a kitty's tummy. Even vegetables in rich sauces are a no-no. You can allow your cat to join in the celebration with a thin sliver or two of turkey breast . . . but why not prepare a special feline-friendly Thanksgiving meal for the kitties? Here are three delicious and easy to make recipes for a tasty Thanksgiving Feline Feast. Each recipe can be made up ahead of time. Of course, take care there are no turkey bones. They can splinter and pose a danger in a cat's digestive tract. Blend all ingredients in a medium size mixing bowl and serve. You can refrigerate any extra for the next day. Just like people, kitties appreciate leftovers :-). This recipe makes twelve two-ounce portions. Blend all the ingredients in a large mixing bowl. Refrigerate or freeze until ready to serve. It should be eaten within three or four days if refrigerated or you can freeze individual portions and they will keep indefinitely. First, combine the wheat germ, wheat flour, soy drink mix, and yeast in one bowl. In a second bowl, mash the sardines, and mix them together with water. Next, blend the sardines and water with the dry ingredients, and knead the resulting mixture into dough. Roll the dough into quarter-inch balls, and place them on a greased baking sheet. Flatten them into a slightly cookie-like shape. Bake for approximately eight minutes, or until set. Extras can be stored in a tight-sealing container for up to two months. If your kitties could talk, I know they would tell you they are thankful for the special thought (and food) you gave them on the holiday — but don't be surprised if after enjoying their mini-feast, your satiated felines camp out on the sofa for an after-dinner snooze.